Which ink cartridges do I need for my HP Officejet 150 Mobile All-in-One Printer? HP 98 Black or HP 94 Black cartridges and HP 95 Tri-color or HP 97 Tri-color cartridges. For your European or UK HP Officejet 150 Mobile All-in-One Printer you need HP 337 Black or HP 338 Black cartridges and HP 343 Tri-color or HP 344 Tri-color cartridges. 1. Remove the new ink cartridge from its package and then pull the colored tab to remove the protective film from the cartridge. 2. With the printer turned on, open the cartridge access door. Wait for the carriage to stop moving. This should take only a few seconds. 3. Lift the ink cartridge latch open and gently remove the ink cartridge from its cradle compartment. 4. 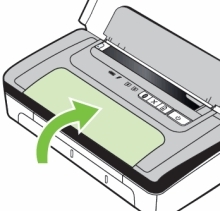 Insert the new ink cartridge into its cradle compartment at the same angle at which you removed the old ink cartridge. 5. Close the ink cartridge latch. If the cartridge is inserted correctly, closing the latch gently pushes the cartridge into its cradle compartment. Press the latch to make sure it is seated flat on the cartridge. 6. Close the cartridge access door. 7. 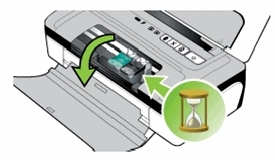 Wait for the carriage to complete the ink cartridge initialization routine before using the printer.